Ever so often we all need little reminders and a small lesson in "how to" in order to change our bad old habits, thought patterns and perspective and say things in a positive manner instead of constantly reinforcing the negative. Its so easy to slip into this routine of always apologizing i.e. sorry I am late, sorry but.... etc. However, this can easily be turned into a positive statement as you will read below. 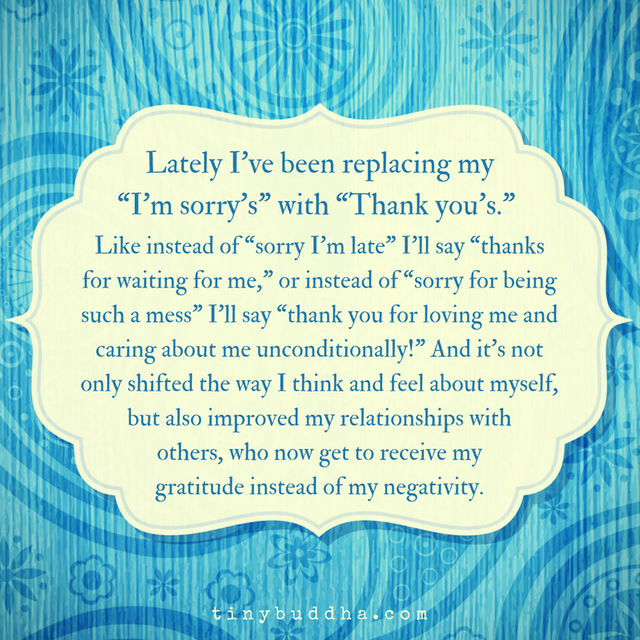 The same statement can be turned around and suddenly you are being grateful instead of negative. Its so easy to do, we just have to keep on practicing! The vibe between sorry and thank you is completely different and gratitude is the most beneficial emotion we could feel. Thank you for this lovely reminder.